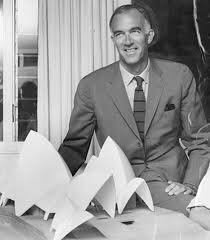 Jørn Utzon with a model of his late 1950s design for the Sydney Opera House. Douglas Snelling was at the peak – and on the precipice – of his design and architecture career in Sydney when Danish architect Jørn Utzon was forced to leave the Sydney Opera House project in February 1966, after years of complex politics. Already it was obvious to international architecture connoisseurs that Utzon's brilliant concept was destined to become an enduring symbol of 20th century modernism. Snelling, born in 1916 east of London, and Utzon, born in 1918 north of Copenhagen, were both First World War European babies but they spent most of their careers on opposite poles of the globe; until 1957 when Utzon arrived in Sydney to start work as winner of the 1956 Opera House competition. In 1964, when they were in their mid-40s, both had designed the greatest buildings of their careers. While Utzon then expected (wrongly) more great architecture projects after his return to Europe, Snelling was becoming aware that his younger rivals in Sydney (notably Harry Seidler, Peter Muller and practitioners leading a new wave known as The Sydney School) were surpassing and excluding him. After Seidler and other architects and aesthetes took to Sydney's streets in March 1966 to protest against Utzon's government-orchestrated exit, Snelling drafted a letter to the editor to vent his frustrations and more commercially pragmatic views. This draft letter was probably unsent and not published by his likely intended outlet, The Sydney Morning Herald. A copy of the typewritten document was held for many years by Snelling's Bellevue Hill neighbours, Drs Abe and Olga Assef, who released it to Snelling's biographer, Davina Jackson, in 2004. Jackson included it as an appendix in her PhD thesis. Douglas Snelling: Pan-Pacific Adventures in Modern Design and Architecture. They wrote that Snelling 'clearly disapproved of Utzon's complex design and its refutation of a conventional reading of functionalism'. They claimed that Snelling '... argues from a modernist position: one could say it was a position that had become doctrinaire by the mid 1960s'. I am sick to the stomach of the smirks and smart quips about Architects at dinner parties and other functions. I am appalled at the loss of dignity to my Profession, brought about by a rabble-rousing, self-advertising minority. For this reason, I signed this as ‘Architect’ for fear that I may be accused of jumping aboard this bawdy bandwagon myself and not because I wish to hide behind a pseudonym. Perhaps a few facts may tend to quell the disquiet in the community, and reinstate Architects in general, as well as point up the role of Architects as designers of buildings truly a product of our age and technology. In the first place, the Sydney Opera House is largely only famous abroad for its fantastic cost in relation to our national product. Many intelligent foreigners, and even Architects, have only vaguely studied the sculptural form of this building, which form has often been admired – but only for its elegant form. Many world-famous Architects who have taken time to study the Plans in detail see this building as sculpture with an Opera House stuffed inside it. As such, this puts the building in the class of theatrical trickery and nonsense. A first principle in architectural design is ‘Form follows function’. A building has integrity and beauty if it is created from the inside out, and the resulting skin is a pure expression of its interior and function. If this results in beauty then, and then alone, do we have fine architecture. The so-called ‘shells’ are not what Architects know as shells. The shell of an egg gains its structure and integrity by its complex shape and thinness. The Opera House 'shells' are constructed using conventional beams and slabs and only pretend to be shells by their external appearance. Perhaps the main blame for the acceptance of the Utzon design as winner of the competition can be laid at the feet of the late Eero Saarinen. Mr Saarinen came to Australia to adjudicate with the others as a kind of God in his profession. His say-so would have been respected above all others, but Mr Saarinen was not God. True, he had some very fine buildings to his credit, but he has also been responsible for many doubtful architectural works. He experimented with external forms unrelated to internal functions and, by so doing, reversed the first principle of design, to read ‘function follows form’– a complete anachronism! No wonder is it then that Mr Saarinen voted Utzon the winner, for he was fresh from similar searching and could not or would not see the error of this erroneous thinking. Indeed, as well, Mr Utzon did the resigning! What pressures caused him to do this, no-one but he would know. In any event, he will have the protection of accepted architectural practice and be paid accordingly for work done – that is of course if he has not laid himself open to litigation for breach of contract. Had the situation been reversed and the Client had sacked the Architect for anything short of negligence, the Architect would be in a position to sue for damages – and rightly so. To talk of petitions from members of the Sydney Symphony Orchestra, based on their knowledge of acoustics, is ridiculous and pointless. What do these people know of acoustics, which in any case is not an exact science, and made more difficult for them because they are the performers and not the audience. The acoustic variants, such as type of performance and number of the audience, makes the resolution of acoustic control rather hit-or-miss, and subject to variation and experiment for these very differing conditions. It is a fact that many of the conditions of the Opera House competition were not resolved, nor solutions attempted, by Mr Utzon’s submission. The amount of seating has been drastically reduced; the traffic flow is poor; the car parking and access were hardly considered and the acoustic design remains to be resolved. These unresolved factors point strongly to the contention that it is not possible to force an interior into a pre-conceived exterior. The competition conditions strictly limited the site to a dimensioned plan. Many competitors at the time questioned whether they could exceed the site area and partly build over the harbour because space was restricted for their designs. They received a firm reply – No! Mr Utzon’s winning design far exceeded the limits of the site. To denigrate Mr Farmer’s Government Architects team is sad and sick. Never before has this State had such a fine group of progressive designers and after only a few years they have created some of the best buildings in NSW. Mr Farmer’s team has also recently taken out many top architectural Awards. The conservative element which once dominated this Department has been rooted out and replaced by creative designers. Mr Davis Hughes, the Minister for Public Works, is to be congratulated for his firm stand -- a stand no firmer than any Client could be expected to take under the circumstances. Mr Hughes is not only resolute, but brave as well. If the Opera House fails from here on – then he will be blamed. If it is reasonably completed then it will always be said that it could have been better. Harking back to first principles, it was doomed to mediocrity anyway, for any building without integrity must be thus. Perhaps Mr Utzon, as the Americans say, wanted ‘out’, for his building achievements to date are most unimpressive and minor. Was this wedding cake too tricky for him to complete? We shall probably never know. Except in ancient times and in feudal societies, no building ever relatively cost so much. It is true also that buildings created through competitions usually well exceed estimates or budgets. They have often doubled in cost, but never reached the astronomical figure of 1000% or more over. An Architect in private practice can very easily lose a valued Client, and even collect no fees if his estimate is not within reasonably accepted business limits. Many Architects refuse to enter competitions because their personal integrity would force them to design within the limits of the competition, knowing full well that other Architects would take a risk of price being no object, and perhaps by doing so, win the competition. Incidentally, an old architectural sage once said of competitions – ‘They throw out the worst, they throw out the best, and select from the mediocre.’ And too, no building in modern times expended so much engineering research – some hundreds of Engineers over two years, all using modern aids and computers. Out of this tremendous effort came a number of positive solutions, only to be disproved by costly experimentation. A designer of anything must surely know within reasonable limits how to build what he commits to paper. The cart-before-the-horse attitude of a pretty picture first is a negative approach to design and today is the ace card of the charlatan. As for the RAIA NSW Chapter, the Executives of this professional body have behaved with dignity and have denied all associations with minority pressure groups. The Chapter Executive today is manned, in the main, by young men of high integrity, who have attempted to have the Government retain the original Architect for better or for worse. This attitude is only right and proper from the Institute’s point of view. Any suggestion that the Executive Officers are conservative old fuddy-duddies is untrue. This may have been so in past years, but is definitely not so now. At a time like this, it is indeed sad to see the architectural profession lose so much dignity, and gain so much notoriety, all because of one member who could not face reality, and because other members carried banners saying he could. By all means let us carry banners but these are best displayed as tenacity and integrity, if we have the talent so to do. In these days of over-simplification and over-specialisation, let us get back to being just good designers, in all fields. Our present society seems often to be hell-bent; it is a large part of the Architect’s job to be constructive and creative if we are not to out-Rome Nero. * Stephens, McNamara and Goad did not acknowledge Jackson as either their direct source or the historian who discovered Snelling's Utzon letter.